The re-launch of McQ Swallow collection came as a surprise. The collection left it’s decorative past behind and moved into a more provocative, bold form with the swallow logo spelled out across the chest and sleeves, as redesigned by artist Tom Tosseyn. The collection is capital D Dark, rough and very real. It reminds me of rough kids from 90s street gangs. It’s very inspiring. 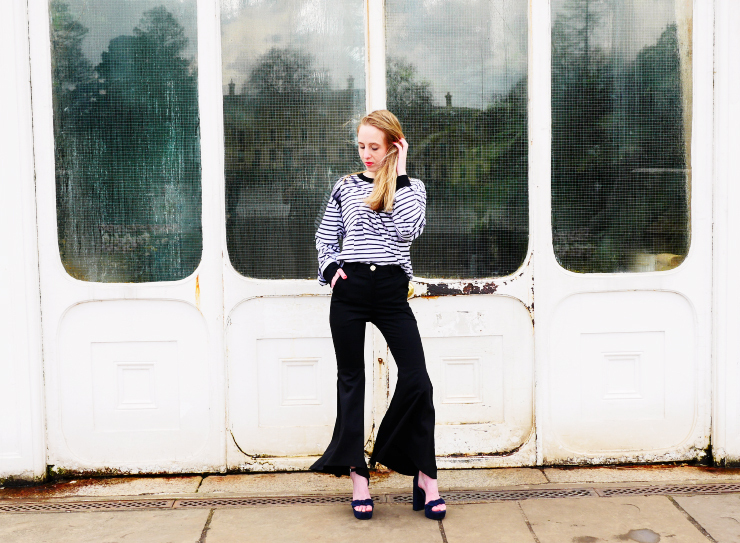 It only seemed appropriate to wear the striped prison-like sweatshirt with flared pants and platform shoes to spike this bad outfit with a drop of elegance. It has the perfect balance between rough and modern day femininity. We ventured out to Kew Gardens to take these photos. The beautiful long windows of glasshouses and secretive balconies added something mysterious to the photos, and I must say I’m so pleased with the effect I now have a smug face on. Ulalal, what an awesome outfit! These pants are radical! Those jeans are the coolest ever! Love em! This look is so nice!! Love your pants, and the photos are beautiful! Beautiful outfit and pretty photo.